Each state in India has its own religious or state festivals. These take on a cacophony of sounds, color, people and most importantly, spirit. Click on the map pointers below and read more about the incredible festivals of India! The skies are alight at night and so it is best to enjoy the celebrations in residential areas – and ideally with a family who can share with you the traditions and explain why certain pujas (prayers) are done during this auspicious festival. Do be prepared for some noise – particularly within the urban areas. This is a festival celebrated in style. Only in recent years have the number of fireworks reduced due to many government environmental health warnings. With this in mind, arranged firework displays in public parks and recreational spaces are an attractive option for those wishing to celebrate. Come with an appetite to enjoy the many special sweets that are offered during this most festive of seasons. If you don’t like loud noises, bring some ear muffs or plugs to drown out the sound of firecrackers. Severe sufferers of asthma or those with respiratory problems should avoid visiting Delhi during Diwali, or take precautions to avoid the smog. The Hindu festival of color is a fabulous occasion, where locals of all ages take to the street to ‘play colors’. In Jaipur there’s a famous festival where elephants are ornately decorated, and you can observe and even participate in fun competitions, from tugs of war to elephant races! With colors abound, this is probably India’s most vibrant festival and is fun for all the family. Traditionally, the colors of Holi were made using natural dyes, such as turmeric. In recent years, some of the colors that are being played with are not natural and not only stain clothes, but can also damage the water supplies. With our team, please request and use natural colors, which have made a recent revival among the more environmentally conscious. Holi, like all festivals in India, can get rather crowded in the streets, so be sure to go out without any valuables, and stay close to your guide. 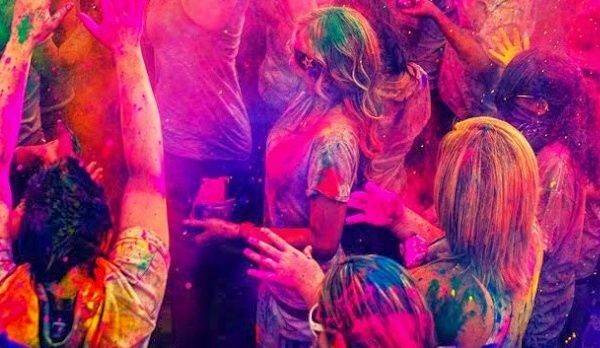 Some special Holi parties can be arranged on your accommodation premises, which are just as fun and will provide you the opportunity to learn the history of the festival, as well as eat the festive treats that Holi is famed for. Lord Ganesh is the Hindu elephant-headed god, who is believed to bring much good luck and prosperity to people. On the birthday of this beloved God, Hindus store elaborate and colorful idols of Ganesh in their homes and workplaces, as a means to request him to remove obstacles from their life. The idol is gifted with many offerings – from flowers, to sweets to fruit, treated like a VIP guest. On the eleventh day (usually September 15th), the idols of Ganesha, to the throes of song and dance are paraded with grandeur through the streets, before immersing him in water, usually in the sea of lake. While Ganesh Chaturthi is celebrated across the states of Maharashtra, Goa, Tamil Nadu and Andhra Pradesh, you are best to head to Mumbai, where you enjoy a spectacular celebration! Located within a central suburb, a towering temple that is dedicated to Lord Ganesh, knowns as Siddhivinayak, comes to life, as devotees congregate and join in the prayers. In turn this then becomes a street party, as different neighborhoods compete for the most impressive idol of the Hindu deity, in which the Ganesh idols are even anointed with a red powder. The celebrations end in the dusk light at the shores of Mumbai’s epic ocean. You may find it surprising that after all the hard work of the artisans to make these beautiful statues, that the Ganesh idols are immersed in the water and often disappear into the ocean, however this is to recognise that not only is the universe constantly changing, but Ganesh can be prayed to wherever you are, as his energy always remains. A torch for the evening procession may also be helpful. A popular boat race in backwaters of Kerala on the famous Lake Punnamada, in which ancient naval architecture of snake boats (or chundan vallams as they are known locally) race to claim a trophy. This is a real village affair in which 64 paddlers row in rhythm to the traditional song or beat of the boatman, who lead the vessels. Additional ceremonial water processions, decorated boats and floats also add to this carnival atmosphere. Did you know? The Nehru Trophy Boat Race was named after Pandit Jawaharlal Nehru, who served twice as the President of the Indian National Congress during India’s struggle for independence under British Colonial India, and became the first Prime Minister of independent India in 1947. The locals of Kuttanad Village see the race as a great celebration, and look forward to it with fervor each year. A victory at the race is something that is proudly celebrated by the victors and their families for months on end. Share in this joy! August is monsoon season in Kerala, but this does not mean that the rains take place throughout the day – there is normally a fast outpour during the late afternoon or night, and with the warm, tropical sunshine of the region, most of the ground dries very quickly. Some of the lesser developed road of Kerala have poor drainage systems, so there can be some water build up, which is something to be aware of as this may delay travel. While this is a village even, some 200,000 people attend to watch this grand event, so be prepared for these crowds, and stay close to your local guides. Special seating can be arranged along the banks of the lake for foreign guests and observers. This is such a frolicking festival to observe the fun side of Rajasthani culture! This three day folk festival celebrates the traditions of the inhabitants of the desert and their nomadic way of life. 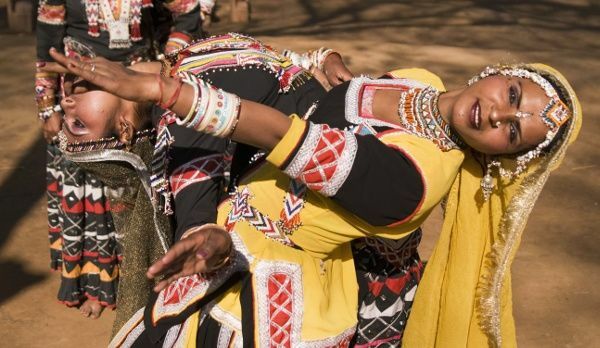 Discover the culture, music and colorful fashions with an explosion of music and dance performance. Folk performances abound, including snake charmers, fire dancers, puppeteers and acrobats, creating a feast for your senses! Get ready to witness the most glorious moustaches that would put any modern day gent to shame, as they are shaped into various styles. You can witness many of the contests that are on display, from the turban tying competition, to the Mr Desert Contest. The most popular folk dance of Rajasthan, Gair, is in full swing, performed by the Bhil community, with both men and women in captivating costumes, as they exhibit half swirling dance steps, as the men keep a consistent tempo with wooden sticks! The festival of Navaratri is based on the concept of the good over evil, as told in the famous epic, the Ramayana. You can expect much dance and drama to accompany this festival! Celebrated across the states of Gujarat, Karnataka, Tamil Nadu and Bengal, people gather in courtyards for the community dances of Garba and Dandiya Raas, dressed in festive clothing, often dancing in pairs with painted wooden sticks. This nine nights, ten day long Hindu religious festival is dedicated to Goddess Chamunda. On the tenth day of this festival is known as Dushera (or Dussera), a time believed when Lord Rama (the hero) defeated the demon king, Ravana, and when Durga, the warrior goddess of Hindu Mythology, defeated the buffalo demon, Mahushasura. Dushera is the time when regaled elephants proceed with the idol through colorful streets. Dozens of cultural performances and traditional dancing take place in Mysore Palace, with the the great Durbar Hall. Know your Goddess! Chamunda is also identified as Chamundi or Sanchi Mata), who is the fearsome version of the Hindu Divine Mother, with many arms, and whose role is to give the impression of the reality of life (having killed two monsters) and comes from the esoteric traditions of Hinduism and Buddhism, known as Tantra. Navaratri is known in eastern India as Durga Puja, and is a time when many statues of the warrior goddess, Durga, are immersed in the River Ganges, India’s most revered and holy waters. Witness the The Ramlila, an enactment of the life of Lord Ram, in the lead up to the tenth day, when life effigies of Ravan, his son and brother Meghnath and Kumbhakarna, are set alight. Sri Chamundeshwari Temple is a marvellous living temple that sits on Chamundi Hills overlooking Mysore city, and is where many of the religious processions of Navratri begin from – and a great, ancient wooden chariot is often brought out for the occasion. It is well worth a visit to Sri Chamundeshwari Temple to witness the worshippers, who often are pilgrims from across the state, come to pay their respects to their Goddess. If you have not visited a living temple before, you will notice that the crowds are lively and pious in their approach – not unlike super fans at a rock festival, or worshippers at an evangelical church. Bring a red cloth with you during Dusshera to wipe the feet of Goddess Durga – it is believed to be auspicious and bring prosperity! Look out for the beautifully colored Indian roller bird during the festival, which is also considered auspicious! Pack light clothes. Blouses/shirts, long trousers and dresses/skirts are appreciated by devout worshippers and avoid unwanted attention. Women should bring a duppata (scarf) as a means to cover their chests as a sign of respect. Pongal is South India’s harvest festival and a time to give thanks to nature for its first harvest of the year. The celebrations last four days and include dancing, cattle races, bonfires and plenty of sweets and snacks. Homes are decorated with Kolam, a traditional floral design. Witness the puja (prayers) that the local people observe right outside their houses and in the streets, as they thank Indra, the king of the Devas – the god of thunder, lightning, storms, rains and river flows. Bonfires are lit at night, to keep the chilly air warm for worshippers, and to discard unwanted items. During the festival of Pongal, the Masimagam Festival takes places in the small French colonial town of Pondicherry, where the numerous local temples bring their idols and deities to the ocean for a ceremonial, sanctimonious dip. Bring an appetite and a sweet tooth! Always ask before taking photos of local people, as a courtesy. The leading and famed writers of the world congregate for three days of highbrow activity at one of the world’s largest free festivals of its kind. Allow your literary senses to be spellbound by packed schedule of readings and discussions. Co-founded by Scottish modern author William Dalrymple and Indian writer Namita Gokhale, the festival first began in 2006, as a way to bring together writers and literature lovers together. Today, you can expect Nobel Laurates and Man Booker Prize winners attending. Some notable names from previous years have included Chimamanda Ngozi Adichie, His Holiness the 14th Dalai Lama, Ian McEwan, Oprah Winfrey, Pico Iyer, Salman Rushdie, Stephen Fry, and Vikram Seth. The main venue takes place at The Diggi Palace Hotel, in the heart of Jaipur, with smaller venues across this pink city. Familiarise yourself with Indian authors and writers who bring alive India prior to your visit. We recommend you take a journey from simple fiction books by Chetan Bhaghat to more highbrow works by Amitav Ghosh and Salman Rushdie, autobiographical works by Khushwant Singh, the fabulous poetry and works by Rabindranath Tagore to the great travel books by William Dalrymple, that really bring India’s culture alive. Review the schedule to find out who is speaking and reading and bring along your favorite book to get signed as you rub shoulders with renowned authors from across the globe. If you wish to be up close and personal with the speakers, you might wish to choose to volunteer. Prepare some questions to ask your favorite authors in advance! This week-long cultural festival brings an array of revered dance troupes and classical dancers from across the different regions of India and the world to perform and celebrate the world of classical dance, with the UNESCO World Heritage site of the Khajuraho temples as a powerful and mesmerising backdrop. The festival takes place in an open air auditorium, usually in front of the renowned Chitragupta Temple, which is dedicated to the Sun God, Surya, and the Vishwanatha Temple, which is dedicated to Lord Shiva. Bring money to purchase exciting traditional crafts sold by the local craftspeople at the open market. Polish up on the different types of classical Indian dance forms – perhaps ask for a dance class during your trip to India in advance, so that you have a greater appreciation for the styles on show. 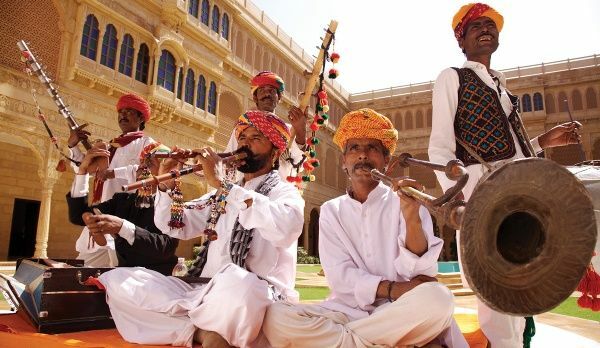 The Jodhpur Rajasthan International Folk Festival (RIFF) is one of the most legendary folk festivals, as it brings together musicians and artists from all over the world, with often exciting musical fusion performances. The backdrop to this inspiring event is the impressive Mehrangarh Fort. Inform your Travel Consultant that you wish to visit, as some fast track and festival tickets can be arranged in advance to avoid the queues. Be prepared to try your hand at traditional instruments during the many beginner workshops that take place in the fort walls. The desert’s most revered animal, the camel is celebrated! Decorated in exquisite costumes, camels are paraded from Junagarh Fort through the streets of the usually sleepy Rajasthani town of Bikaner to the Polo Ground. Witness the several competitions that happen after the magnificent procession, plenty of colorful bedecked camels – who are considered the ship of the desert, and uplifting music! Think carefully before purchasing a camel – ask yourself how you will get it home! The Muslim community congregate to celebrate the end of Ramadan, the Islamic holy month of sawm (fasting). This joyful festival that promotes togetherness is a time for feasting, gifting, and sweets! Come with an appetite to taste the delicious biriyani, sweets and festive foods that celebrate an end to the fasting! Highlight if you are vegetarian. There are often vegetarian alternatives to the biryanis on offer, especially for guests. Be respectful around the mosques and ensure your shoulders and chest are covered in the robes (these are often supplied to you). A harvest festival celebration that proudly displays the culture and heritage of Kerala. While steeped in Hindu mythology of an asura (demon) king called Mahabali, this has become a non-religious festival last for ten days and welcomes all people, regardless of religion, class or caste into homes for big feasts that are served traditionally on banana leaves. Festivities for Onam begin ten days before the harvest, on a day called Atham, when it is believed the mythical King Mahabali returns to his kingdom. Followers begin arranging their homes appropriately, adorning them with flowers in a designs called pookalams, usually only yellow ones, as this is believed to please the god. Two days later, on the day of Chodi, people begin visiting markets as they shop for new clothes, jewelry and gifts, and ingredients to prepare for the big feast. Aside from feasting, the festival is celebrated with games, sports, dancing. There are also many temple visits where you can observe devotees praying for blessings. The best place to witness Onam is in Vamanamoorthy Temple in Thrikkakara, not far from the popular city of Kochi. Dedicated to one of the incarnations of Lord Vishnu, this temple is believed to be where this good demon king lived. Bring an appetite and a sense of goodwill. As one of the largest livestock fairs globally, the Pushkar Mela is a cattle fair that combines the nomadic culture of Rajasthan, trade, and even a longest moustache competition! Around 30,000 to 50,000 camels congregate in this small desert town as the camel owners set up camp along the sand dunes. The camels are adorned in colorful outfits, with beauty contests for the best dressed, as well as races. You can expect several religious rituals alongside the mela (fair), in which pilgrims bathe in the holy waters of Pushkar’s lake, which is said to cleanse them of their sins during the auspicious time of the full moon. Camels and other livestock, including horses and cows, are also traded in the traditional way, which is a highlight of the fair for guests to witness. You can enjoy musicians and dancers, acrobats, magicians and even snake charmers. Witness the grand finale of th Pushkar Mela with the large fireworks display that is put on, as well as a maha aarti (fire worship) that takes place along the lake. We highly recommend you view the Pushkar Mela from above by taking a hot air balloon in the early morning or evening over this quaint yet bustling desert town. Stay close to your local guide to help you navigate through the hustle and bustle. Keep your valuables and money locked in your hotel, as there are many gypsies and children who beg, as well as priests who offer you a blessing, or flower vendors offering blooms, but only in return for a sizeable donation. Be aware of taking photos with camel traders, who will often expect a tip for the service. Makar Sankranti is an auspicious kite flying festival that celebrates the day that the sun moves into the northern hemisphere. At this time it’s common for the people of Jaipur to make a pilgrimage to the Gatalji temple, 10 kilometers from Jaipur and for them to pray to the sun god for blessings over their health, wealth and crops. The festival lasts for three days. The highlight however is always the kite flying in Jaipur. Kite flying has always been a popular childhood sport across India but has experienced a renaissance in recent years. If you peek up at the rooftops of Jaipur on the 14th January, you’ll see many bodies of varying ages taking control of the string of a variety of shaped, colored kites that adorn the city’s skies. Mythical creatures, Hindu gods, political caricatures and other unusual kites dance magically in the sky, competing for kite flying trophies. Makar Sankranti has provided a global platform and day for international kite flying professionals yet this community event remains open to all. You’ll witness children clambering to get their kites into the sky, aided by their families. With the kites launched on sharp thread the atmosphere is electrifying as kites get chopped by other kites and the broken kites fall to the ground, being chased by other children waiting in the streets below. Dexterity and skill is demonstrated in the droves – one Indian master kite designer has previously demonstrated how to fly an astonishing 500 kites all from the one string. Many kites have been handcrafted by traditional Indian craftsmen who venture out from surrounding villages just for this event. Tukal kites, which are four-stick kites, are thought to be the most difficult to maneuver. By night you can watch illuminated kites soar into the stars. Part of the day involves donating clothes, so you may wish to arrange a visit to a local NGO on the morning of the festival. While steeped in various traditions that often go back decades and even centuries, the festivals in India vary in their attitude. Some spiritual festivals tend to have a sober basis to them, with fasting taking place before or during the day, pandits (priests) clad in simple orange or white loin cloths performing various puja (prayers) at the temple. Others are purely playful – with an joyful and childlike element to them that are fun for all the family – from boat races to firework displays to painted elephants! You can also enjoy contemporary cultural festivals, that celebrate the fusion of modern India and the international community, such as the Jaipur Literature Festival and Jodhpur Rajasthan International Folk Festival, which we had to include as they are worth attending for bibliophiles and music aficionados alike. We recommend you take the advice of our local guides and follow their lead (when in Rome) after all, and show your respect through your attitude, open mindedness and appropriate attire, particularly at places of worship such as temples, churches and mosques. It is absolutely worthwhile planning your vacation to India around one of these exciting events. What’s your favorite festival of India? Let us know in the comments below. Unity in Diversity. India has a lot of different communities in one unity. Beautiful culture. We can see this only in our India.